Cleaning and sealing natural stone flooring. In this information guide we tell you why you should correctly clean and seal and natural stone surfaces you may have in your home including natural stone floors and natural stone worktops and fireplaces etc.... By doing so you can ensure that they are then resistant to any water or moisture that they may come into contact with tha they last. A natural stone surface, once prepared and sealed correctly, can add a great deal of style to your property and give it a real feature relative to your desired look whether that is modern and contemporary or more traditional. Read through our content below for tips and information on the best methods on how to correctly prepare, seal and care for your stone surface. This is a simple test and will confirm for you if your tiles, concrete or stone floor or worktop has been sealed. It is know as the "Water Test". Pour a little water onto your surface and level out with your finger and observe. 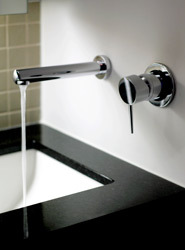 If the water is absorbed then your surface needs sealing as soon as possible! However, if the water turns into small balls and is repelled then your surface is fine and has already been sealed. Natural stone products contain dirt, residues, dust and grime in their pores. These pores need to be cleaned well before any sealant is applied. If dirt etc is trapped under the stone sealer sooner or later it will cause a milky white residue between the top of the stone and the underside of the sealer. Once the sealer is applied the only way to remove this is to completely remove the stone sealer, clean thoroughly and re apply the sealer. Firstly, you should hoover the surface as well as you possibly can and a stone surface cleaner should then be applied to remove and further residue that remains. Most surface cleaners can be diluted. The dilution of the cleaner depends upon the surface you are cleaning. A stronger solution is required if you are cleaning Terracotta, unpolished marble or granite. If the surface has already been honed or polished then in most cases a weaker solution is fine (this also includes limestone). Once the dirt has been completely removed the stone can then be sealed. Pretty much all natural stone products will stain almost immediately after spilling anything on them. Sealing these surfaces will in most cases avoid any permanent damage but to be on the safe side, any spillages should cleaned up straight away. The method of sealing a surface very much depends on the type of surface you are sealing. If you would like to seal Limestone, Sandstone or Terracotta surfaces they should be sealed before they are laid (if they are tiles) due to the fact that they are very porous and will soak water from the grout or adhesive you are using (this water will also be stained water and will mark/stain the surface). This applies particularly to Terracotta as it is immensely porous. When sealing you should apply sealant to the front, back and sides of the material before laying. Limestone is also particularly vulnerable and gloves should be worn when handling it as finger marks can stain the surface and will not necessarily show until its too late. Granite, Marble, Slate and Travertine are sealed on all edges and the top after being laid and grouted. These floors must be thoroughly cleaned prior to sealing. 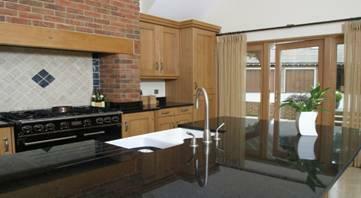 Granite and other stone kitchen worktops should be sealed to help prevent finger and water marks. If you have sealed your surface correctly it should not need re-sealing for at least 5 years. To re-seal a surface, special sealant removers can be purchased that will completely remove any existing sealant and allow you to apply the new sealant to a clean and sterile surface. This will ensure that you get another 5 years worth of protection for your floor without any damage or imperfections. A natural stone floor can keep its natural finish for a lifetime if looked after properly. To ensure that this is correct ensure that you are using the right products for your floor type. In our "Top Tools" area below you will find a range of products suited to many flooring/surface types. Make sure that you read the manufacturers guide lines on what surfaces the product can be used on. Aside from flooring surfaces you may find a great deal of other stone surfaces within a property such as stairs, tables, pilers, baths, bath surrounds and even fireplaces. Fireplaces can be particularly susceptible to staining due to the carbon deposits produced (for open fires) and also UV damage. These surfaces should be sealed according to the methods above in order to prevent any damage or staining.